I've been thinking about that remarkable incised-alabaster vessel that is published in MVB Vol. 6, p. 1006 [K7749] and just had to send you some comments about both the unique combative scene on it, as well as it decidedly non-standard PSS glyph sequence. As noted in your on-line comments, two combatants clearly wrestle with one another and stab at each other with sharpened femurs. Both are clearly marked as captives by the bark-paper pulled through their ears, their shaved heads, and by the vestigial ropes around their necks. They are naked save for simple loincloths. The uppermost combatant has his opponent on the ground, stepping on him as he drives a sharpened bone into his cheek, letting blood as he does so. This fellow is named hieroglyphically as to-k'a/a-CHAK-XIB', to'k' a[j]-chak-xib' or "Flint, He of Chak-Xib'" (Chak-Xib' must be an unknown site). The losing combatant desperately kicks at his assailant with his right foot and grasps at the back of his head with his right hand, all the while stabbing him on his right side with a sharpened bone. This chap is named a-JANAAB'-?/a-MUK-ni, a[j]-janaab' a[j]-muk[uu]n, or "Cornflower, He of Mukuun" (again, Mukuun is unfortunately an unknown site). As they fight, two sumptuously-attired lords look on. Their attitude is almost that of "seconds" at a duel, and they seem to hold more sharpened femurs at the ready should the combatants need them. This gives one the impression that this particular fight between captives was to the death, rather than merely to first-blood (which has clearly been drawn already, with no sign of abatement in the battle). The rightmost "second" is clearly a lord, and he wears the jester-god crown of office, as well as many sumptuous jades and quetzal feathers. He also smokes a cigar and holds out the most sharpened bones: three in his left hand, and one outstretched to the leading combatant in his right. The leftmost "second" is dressed as an itz'aat or "sage", and he holds out a bone to his favorite as well, though mayhap somewhat perfunctorily, the outcome being somewhat obvious already. yu-k'i-b'i lu-mi-li pi-tzi-la u-WI' wi-WINIK-ki-li b'a-TE' pi-tzi-la u-NICH-ki-li ka-b'a-la pi-tzi-la, y-uk.\'ib luumil pitziil u-wi'-winik-il b'ate' pitziil u-nichkil kab'al pitziil, "it is the drinking-cup of the dirty-ballplayer, [who is] the last man of the great-ballplayer and son of the earthy-ballplayer". It's hard to relate this to any great extent with what's going on below, and perhaps it's a mistake to try. PSS texts rarely have any relation to the iconographic program of a vessel (being largely concerned with the creation and ownership of the vessel itself). Moreover, there's no real "ballplayer" imagery in evidence. That said, it's hard not to want to connect the unique and interesting "last man" phrase to the bloody combat depicted. Any thoughts? Some more comments about Vase K7749. yu-k’i(? )-b’i lu-mi-li pi-tzi-la ‘u-WI’ wi-WINIK-ki-li b’a-TE’ pi-tzi-la ‘u-NICH(? )-ki-li ka-b’a-la pi-tzi-la à Yuk’ib’ Lu’umil Pitzal, ‘U wi’ winikil, b’a[‘]te’[l], pitziil. ‘U nikil Kab’al Pitzal. As a matter of fact, the only difference between Zender’s reading and ours consists in the employment of secondary meanings for some of the terms used in the text. While it’s true that the word wi’ may be translated as “last” in calendric contexts-, in many other cases its alternative meaning as “root” (Boot 2002: 86) fits much better in the translations. So, ‘u wi’ winikil can be read as “root of manhood” instead of “last man”, taking the noun winik “man” in its abstractive derived form by means of the common -il suffix. We consider that this title is more appropriate given the associated iconographic scene which, by the way, we do firmly believe it’s intimately related to the text. This is evident when we take into account the next title worn by the man to whom the nominal phrase (and the vessel itself) belongs. Zender translates the glyphic sequence b’a-TE’ as the word b’ate’, “great”. However, the consonants /l/, /j/, /h/, /‘/, /n/ and /m/, as well as the pre-consonantal /h/, were generally abbreviated or omitted at all in the written texts, and orally restored during the act of reading (Lacadena and Wichmann 2001; Lacadena 2001; Alfonso Lacadena, personal communication, May of 2000). Keeping this in mind, we may alternatively read that sequence as b’ate’l. (AH) BA’TE’EL 3: batallador 2. AH BA’TE’ELO’OB 13: pleitantes 3. AH BA’TELBA 3: guerreador, hombre de guerra…” (Barrera et. al 2001: 40). “A[n] …example [of this principle] can be found in the spellings TE’-e’-le (e.g. Kerr No. 3744) and TE’-le (e.g. Kerr No. 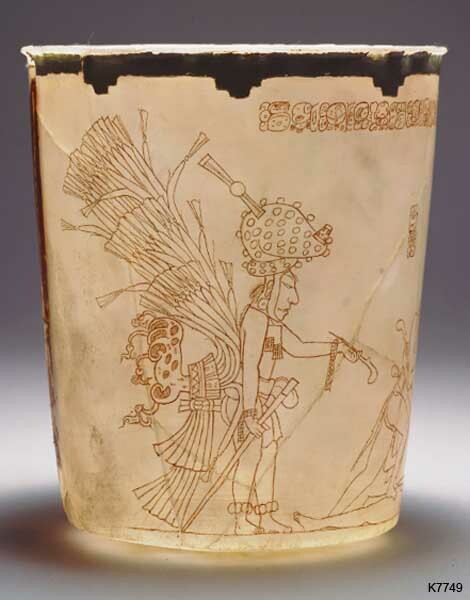 4991) in the contents part of the Primary Standard Sequence on Classic Maya ceramics. These glyphic spellings clearly indicate ‘underspelling’ (CVC-e’-le vs. CVC-le) of the lexical item te’el.” (Boot 2002: 7, our insertions). Grosso modo, the main phrase is a variant form of the common PSS which appears in ceramic vessels often gifted between members of the Maya elite. Its text states the name of the owner of the vessel (Lu’umil Pitzal) -as well as his titles and the name of his father-, while the two secondary phrases restrict themselves to name each of the wrestlers shown in the scene below. This way, our reading of the titles ‘U wi’ winikil “root of manhood” and B’a’te’el “warrior / wrestler” prove themselves both productive and related to the accompanying iconographic scene. Moreover, the recurrent mention of ball game in the two nominal phrases from the main text and in the third title worn by Lu’umil Pitzal-, may be very probably related with the association discovered by Karl Taube between ball game and Maya “gladiatorial combats”. There’s also plenty of evidence that suggests that the Classic Maya developed and practised a vernacular Martial Art also called b’a’te’el according to both glyphic and lexical entries- (Barrales 2004). Maya B’a’te’el was one of the most sophisticated combat methods around the world at this time, and it employed a vast repertory of offensive-defensive techniques, including projections, tackling, choking, bone breaking and dislocation, and blows and digital pressure against nerve centres. In many ways, it was actually similar to modern Judo and Aikido. As a matter of fact, what we see in the iconographic scene which accompanies the text on K7749 is nothing less than a grappling or “ground fighting” combat, and it certainly presents many elements that a professional or expert martial artist will recognize not only as “smart” but, more important, technically faultless. Of course, this is not the place for a full discussion of this scene from the martial perspective, nor to present our complete arguments in favour of the existence of specialized -or at least formally trained in hand to hand combat- warriors among the Maya. We just want to point out that, in this particular and unique context, we find strong supporting evidence for our hypothesis, from the epigraphic, iconographic and lexical sources. 2004 Más allá de las imágenes de la guerra y la captura: Evidencias iconográficas de la existencia de un Arte Marcial autóctono entre los Mayas del Período Clásico. Unpublished thesis. Final text submitted to lecture. UADY, Facultad de Ciencias Antropológicas. 2001 Diccionario Maya. Editorial Porrúa. México. 2002 A Preliminary Classic Maya-English / English-Classic Maya Vocabulary of Hieroglyphic Readings. Leiden University, Netherlands. Unpublished manuscript. 2001 Passive Voice in Classic Mayan Texts: CV-h-aj and n-aj Constructions, en: The Linguistics of Maya Writing, ed. by Søren Wichmann. University of Utah Press, Salt Lake City. 2001 On the Representation of the Glottal Stop in Maya Writing, en: The Linguistics of Maya Writing, ed. by Søren Wichmann. University of Utah Press, Salt Lake City. Following Alfonso Lacadena’s ideas with respect to the conventions employed by ancient Maya scribes, we believe that, besides the pre-consonantal /h/ (Lacadena and Wichmann 2001, Lacadena 2001), the pre-consonantal /’/ could also be abbreviated or omitted in the written texts, and later restored during reading. This is based on the fact that both consonants were weak aspirates, and so they were unnecessary or at least not essential- for the graphic representation of a given word. In recent years, Karl Taube presented a provocative paper at the UCLA Maya Weekend, in which he disserted about Maya and Olmec “gladiators”, re-interpreting many ball game playing scenes as true combats held with the main purpose of ritual shedding of blood (Bruce Love, personal communication, January of 2004).